Maamoon joined our firm in 2005. In less than a year to the start of his career, Maamoon was handling various types of cases relating to maritime, labour, personal status and commercial law. 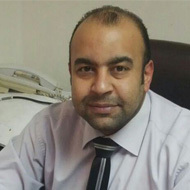 Subsequently, Maamoon joined Port Said Port Authority in January 2004 as a Lawyer in their legal department, which afforded him the opportunity to gain in depth knowledge on how the Marine Governmental agency functions. Maamoon now heads our regional office of Port Said with a well-equipped team of associates and clerical staff which also overlooks the Suez Canal region and the Red Sea ports. Mamoon has managed many high-level cases in reference to customs and the smuggling of goods, and reduce the fines incurred by governmental agencies. Moreover, he has an outstanding record in the Court of Appeals, in particular with force-majeure cases. He has refuted client’s liability in major smuggling cases where the custom’s fines were calculated in tens of millions EGY Pounds. He also handled a case on behalf of a major shipping line where he managed to discharge their legal representative from the liability for smuggling cargoes which their fine was calculated at figures ranging between EGP 8,000,000 and up to EGP 200,000,000. Maamoon has also obtained three judgments from Damietta courts of 1st instance that were affirmed by the court of appeal in which the court allowed our defence exempting vessel’s owners from liability for the existence of the force majeure which is very rare in courts’ real practice all over Egypt. Maamoonhas recently obtained landmark judgments from the Port Said Court upholding a defense based on the vessels owners right to recover the sums which the Suez Canal Authority (SCA) debited from the agents without due right with respect to alleged damage to SCA marine aids and units. Maamoonhas also managed to set up new precedents with the SCA when it comes to refunding balances that became due to ship owners by convincing the SCA to refund such amounts or rebates to the Ship owners’ offshore accounts directly rather than effecting the remittance to the local agents’ accounts withheld with the SCA after several complaints from the misconduct of some of the ships’ agents. Since 2006 , Maamoonhas been acting as a legal consultant for Port Said Chamber of Shipping and in such capacity, we have been requested to give his legal opinion on both contentious and transactional shipping matters the chamber or her members would faceespecially with the governmental authorities. Moreover, he also gives his comment on the draft legislation of the laws affecting the daily business of the shipping agencies operating in Egypt. And in that effect , Maamoonwas able to cancel the ministerial decree regulating the tolls and fees collected by governmental Port authorities with respect to vessels port calls to Egyptian Ports which resulted in exempting many of Liners operating in Egypt from seven digits claims raised by the Port Authorities by virtue of wrongful interpretation of the law. Maamoonhas been involved in a number of shipping disputes and casualties in Egypt, and for years he has been acting as a legal advisor for some of the major Liners operating in Egypt in all of their shipping related disputes.